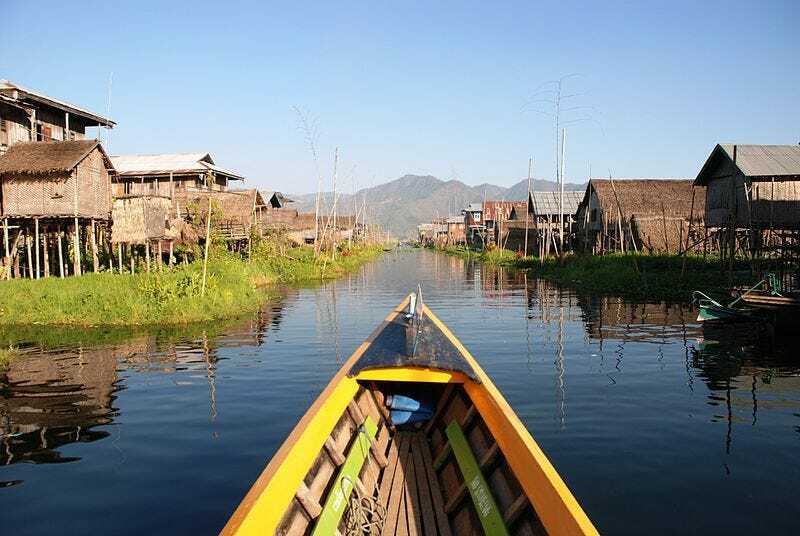 Myanmar's Inle Lake is one of the largest lakes in the country, but in the last 20 years, satellite images have been revealing what looks like a smaller surface area. The lake, however, is still there — it's just hidden beneath a sprawling, floating tomato farm. NASA's Earth Observatory released this image of the lake below which shows just how large of an area has been devoted over to a "floating farm" that grows mostly tomatoes, but some other crops as well. So how did it happen? Although the farm is built quite far out into the lake, the tomatoes aren't literally floating, they're being supported by a vast network of water hyacinth roots that have grown together so tightly that they're capable of supporting another plant on top. Already covering a significant portion of the lake, the farm is still growing; it has already increased fivefold in size since 1992. Top image: Thomas Schoch, Satellite image: NASA Earth Observatory.